Someone Bought This Classic: WWF Macho Machine - WrestleCrap - The Very Worst of Pro Wrestling! RD: No offense to the great Randy Savage, but if bringing out my inner Macho Man means wearing a big pink cowboy hat and doilies, I think I’ll pass. 15 Responses to "Someone Bought This Classic: WWF Macho Machine"
Just imagine of the Ultimate Warrior had this…..
Macho Machine just doesn’t have the same ring to it that Giant Machine, Super Machine, and Piper Machine have. don’t forget Hulk Machine or Animal MAchne. I feel conflicted. Macho is advertising his Macho Machine, yet he’s also wearing an Ico Pro t-shirt. Is this one of those things where you have to do what I assume is the Macho Workout on the Macho Machine in combination with a steady diet of Ico Pro supplements to see results? Would the t-shirt also cost $399.95 (or 4 easy payments of $84.99)? I would totally wear that shirt today. 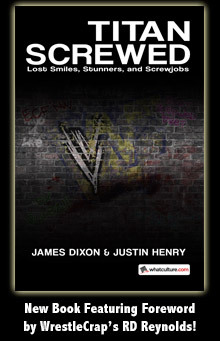 Gotta love the subtle WWE message there: Don’t be a puny wimp who backs down from bullies, make sure you get all big and muscular so the bullies automatically back down from you, because no one who’s under 6 foot tall and weighs less than 250 pounds could ever stand a chance in a real fight. The only way you could go from looking like the before to the after picture in 12 weeks is if this thing came with free office visits to Dr. Zahorian. “As seen on TV? Is there a TV commercial for this thing? If anyone finds that, please send it to me! paul@wrestlecrap.comGOOKER (remove the word GOOKER before you send the email). 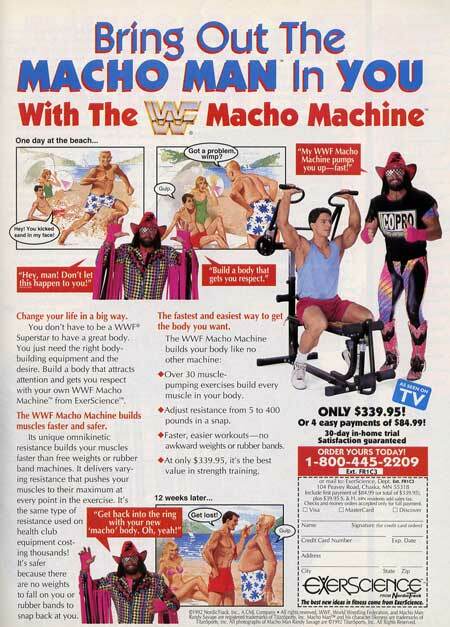 so Macho Man promotes an exercise machine then yearz later hiz brother Lanny Poffo doez the same. kinda cool. BE A MAN! Buy the machine..